Philos is a 1987 49' Gulfstar Motoryacht. She offers a three stateroom/3 head and 2 salon layout, aftdeck with a hardtop, Eisenglass enclosure and ceiling fan, updated wood and vinyl soles throughout, 2500 watt inverter, 20 kW generator, Side-Power bowthruster and Swann security camera system. Her layout and condition make her a fantastic liveaboard and she is Great Loop capable. West Florida Yachts would love to guide you through a personal showing of this 49' Gulfstar 49 motoryacht 1987. 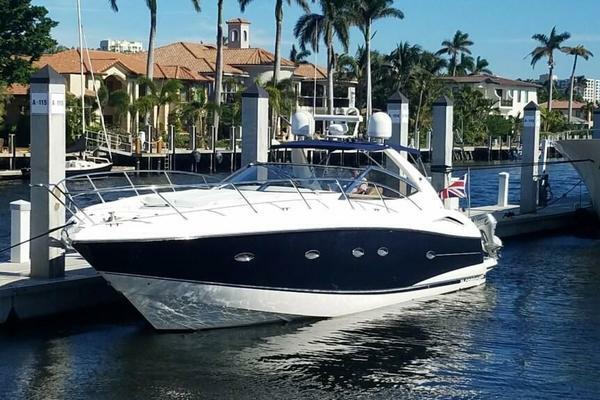 This yacht for sale is located in Palm Coast, Florida and priced at $139,000. For a showing please contact us by filling out the form on this page and we will get back to you shortly! From the Eisenglass enclosed aftdeck, you walk forward into the enclosed sundeck and find a sofa and coffee table to starboard, lounge chair port aft, wing door on each side to each side deck, a door and steps up to the flybridge or a door with steps down to the salon. Once inside the salon, you will find the galley to port, wrap-around settee with antique table to port, companionway to the master stateroom and port guest stateroom/office aft and the companionway, laundry room forward to the guest stateroom and engine room access. The headroom on the aftdeck is 6'7", 6'3" in the upper deck, 6'10" on the flybridge, 6'5" in the galley, 6'4" in the forward guest stateroom, 6'4" in the master stateroom and port guest stateroom/office and 5'5" in the engine room. The master stateroom berth is 6'6" long, the port guest stateroom berth/desk is 6'3" long and the forward guest stateroom berth is 6'8" long. Philos offers a full beam master stateroom aft with a queen size berth and ensuite head with enclosed shower, a guest stateroom/office to port with a single berth that has been converted to a desk and an ensuite head with shower stall with curtain and a guest stateroom forward with an island queen size berth and an ensuite head with enclosed shower. The salon offers a wrap-around settee and antique table with storage to port, opening side windows with screens, teak parquet sole and a door and steps to the enclosed upper deck area. The galley is to port in the salon. The full beam master stateroom aft offers a centerline queen size berth, hanging lockers, storage drawers and cabinets, nightstand, reading light, mirrored headboard, 2 portlights, side windows, wrap-around seating with storage starboard aft and ensuite head with enclosed shower with overhead hatch. The port guest stateroom has been converted into an office, but it could also be converted back to a stateroom only. It includes storage cabinets, mirror, reading lights, 2 portlights, vinyl Oak sole and ensuite head with curtained shower stall. The guest stateroom forward offers an island queen size berth, vinyl teak sole, reading lights, shelves, storage drawers and cabinets, hanging locker, 2 portlights with screens, overhead hatch, anchor chain locker access and an ensuite head with enclosed shower. The enclosed sundeck offers a sofa and coffee table to starboard, lounge chair port aft, storage, Teak and glass wing doors, opening side windows with shades, vinyl Oak sole, sliding glass door aft, door to the flybridge and door to the salon. The flybridge offers a bimini, Eisenglass enclosure, non-skid deck, fold-down wood chart table to starboard, storage cabinets, air conditioning/heating system supply, sunpad, L-shaped seating with storage, Garelick helm seat and teak & glass door to the sundeck. The aftdeck offers a hardtop, Eisenglass enclosure with screens and curtains, non-skid deck, transom gate, ceiling fan, teak deck chairs and folding teak table and rod storage.